I attended to a number of other errands and got home just at noon. I intended to cut out some shirts in the afternoon but felt so tired that I only knit a little. John Whetstone was over in the evening. Grand-pa would have been eighty years old had he lived till today. 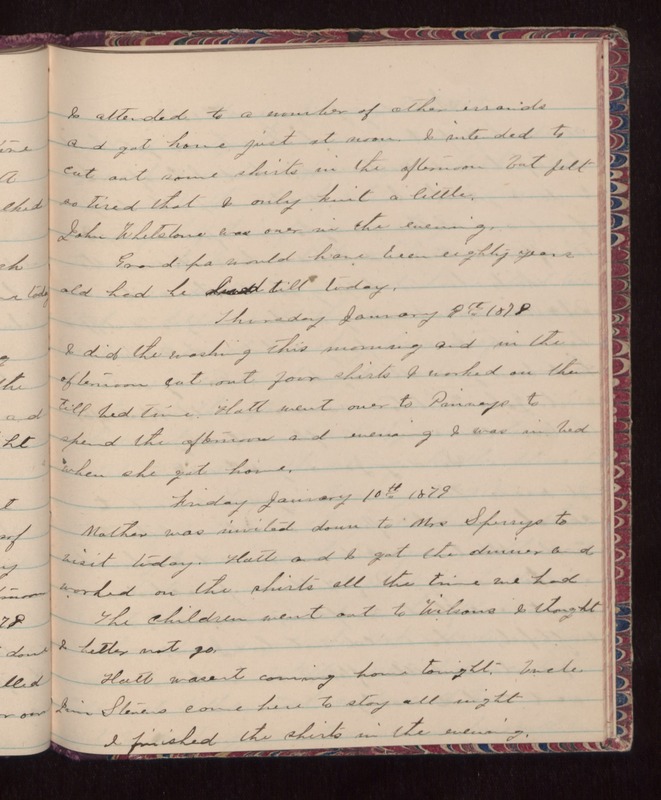 Thursday January 9th 1879 I did the washing this morning and in the afternoon cut out four shirts I worked on them till bed time. Hatt went over to Pinneys to visit today. Hatt and I got the dinner and worked on the shirts all the time we had The children went out to Wilsons I thought I better not go. Hatt wasent coming home tonight. Uncle Jim Stevens came here to stay all night. I finished the shirts in the evening.